With two decades of designing creative, sometimes daring, but always elegant wedding gowns, Pina Fiorenza understands what brides want. “A wedding gown is pure emotion” she says, and choosing a designer that ‘gets you’ is so important. “In a world of ‘the same’, we like to make the difference” says Pina of her Fiorenza Bridal ready to wear and couture brand. The following collection from Fiorenza is unique, elegant, and with a twist of bohemian…made with superior fabrics including luxurious crepe, silk chiffon and tulle, and decorated with sheer lace. Take note of each wedding gown’s details such as handmade buttons, moulded lace and trimming which are unique to the Fiorenza label. We love this wedding dress! Matilda, as you can see has the shape of a mermaid dress, but is not your typical mermaid look. With a long refined bodice and a sheer lace skirt, this dress is to be worn with an air of nonchalance. For those of you looking for a bold and sophisticated body hugging dress, but still with that touch of romance - Matilda with it’s soft lace lets you have it all. Two piece wedding gowns are ultra modern. 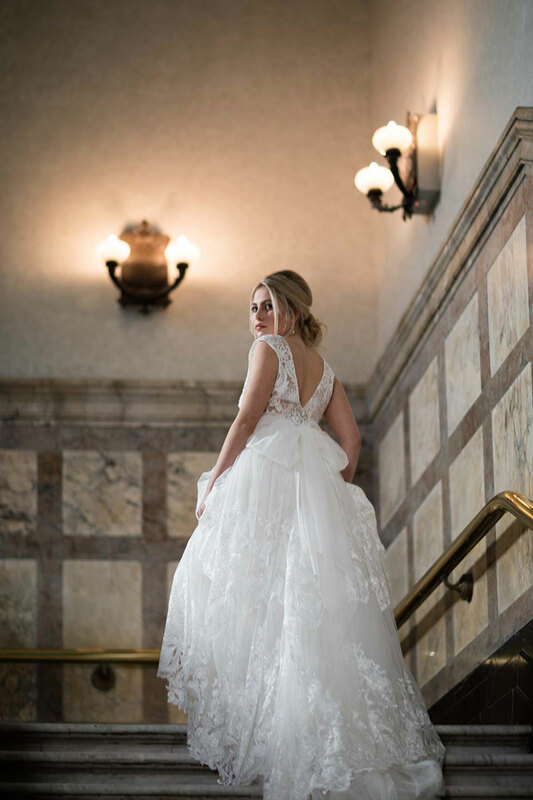 Made for a dynamic and fashionable woman, Lucie is breathtaking and breaks away from the traditional wedding ‘dress’ mould. The soft lace top complements the soft silk chiffon skirt, and together, they make the perfect combination. We adore this combo and are in awe of the metres and metres of soft silk chiffon required to create this beautiful flowing skirt. Lea has an amazing, figure flattering cut, created from soft cotton and silk lace - handmade to fit you perfectly. We love the sleek bodice combined with a wide hem…perfect for the confident bride who wants to dance all night long. This soft, all-through lace gown can’t help but look elegant and utterly romantic. Another gorgeous two-piece, Beadlya is something special! We are in love with this bodice which is fully beaded in trimming lace and appliqued. The beautiful skirt has three dimensions - one in soft lace, another in silk tulle and the top layer, an amazing one hundred year old embroidery appliqué in silk tulle. Together, this wedding outfit blends old world style and quality with new age glamour to create a unique wedding outfit. Innovation comes in many forms and this collection from Fiorenza combines the new and the old in innovative ways to create unique wedding dresses, plus two piece outfits to suit the fashion forward brides of today.